Hed Above Water: Rabbit jumps rope. Hed Above Water: Rabbit jumps rope. I am about two days behind on reading all of my 70+ blogs, and I said everything I needed to say in yesterday’s post. When I logged onto Facebook this afternoon, I see a post from my aunt Roxy that says, “Written for my niece Hed. Sometimes family is not much fun” and a link to her blog, The Artful Rabbit. I read it and I cried. I’ll first state the obvious by saying that “her brother” in the story is my estranged father. I only know bits and pieces of him and his side of the family, and that is only from stories he told me when we were close in my childhood. As an adult, I have only begun now to see how broken and flawed he is-and how I am so much like him-and it scares the holy crap out of me. So here is a story for you all today from my aunt. Roxy has so many memories. I can only one day hope to experience even a portion of the life she has led (and I mean the good parts-I don’t know how many more bad parts I can take at the moment). I am just getting to know my brother’s daughter, Hed, and this entry is for her. Sadly enough my family of origin’s inherent and ongoing craziness has kept me as far away from all of them as I can get. Yes, I love them and I visit them, but I measure the time spent carefully, gauging my ability to avoid a complete meltdown by timing my escapes right. Hed is estranged from her dad, my brother, so we didn’t have a chance to connect until this past year, after she was a wonderful grown up woman. A little background: I didn’t know until I was over eighteen and away from my family that some people have peaceful lives. My parents lived at a high decibel level that was a blend of anger, drama and frustration. When I was a kid there was also a lot of love and laughter thrown into the outrageous mix, but as they have aged the fun has leeched out of their lives, leaving behind a bleak desert made up mostly of complaints and failure. My brother is just 18 months younger than I am. He was a geeky kid who had two eye surgeries before he was six. He was cross-eyed and saw double. He wore thick glasses and somehow flunked first grade. I mean really, how do you flunk first grade? He has a September birthday and nowadays he would have just started a year later, but in his mind he is still scarred with that flunking grade. To make the situation even better (sarcasm intended), we were uprooted from our cozy California childhoods and hauled off to Germany. We adjusted, we made friends, we loved it—all but the army brats we were stuck in the army school with, it was like being sent to hell every single day. That experience shaped my character and made me the fearless woman I am today in a way. Back then I had at least two fights daily with other kids for the entire first year we were there. One was my fight and the other was my brother’s fight. I had to take care of both of us and keep us safe in that horrible school full of horrible ignorant military brats. My mother got to where she didn’t bat an eyelash when I walked in with bloody scrapes and black eyes. She would just ask if I won and nod her head; she got it and she didn’t make a big deal out it. 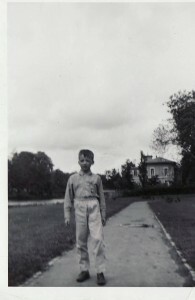 My brother in front of our house, Number 3 Prieger Promenade. She loathed the military families in general and a few in particular. We were air force brats and we were a better caliber of brat in her mind. We lived “on the economy”. Translation: as far away from the base as possible. We spoke German, we dressed in German clothes and we were the only Americans dressed for the climate in the winter. I was always snug in my long woolly stockings and reindeer hide boots. In the attic I still have my brother’s lederhosen and our wooden clogs. We assimilated, and even with crazy parents we were happy. My mom and our maid Ooshie, Ursula turned out to be an East German plant. That's another story entirely...shortly after this photo mom yanked that door handle off going down a narrow German street. Our friends were German, we lived in a German house on a German street and we shopped at German stores. I remember being sent to the bakery on chilly autumn evenings with 50 pfennigs to get bread, hot crunchy bread. There was always just a little left over to get some penny candy but that didn’t stop us from eating the ends off the bread, they were irresistible and worth the spanking. Dinner at the Faust Haus, that's my dad on the end and my little brother grinning in the middle. 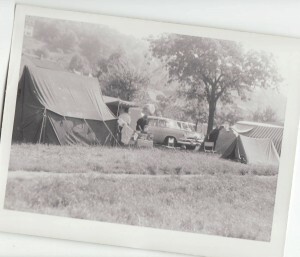 Our family traveled across Europe in a black and yellow 1957 Dodge station wagon that would barely fit down some of the streets. We camped weekends in Heidelberg with our friends, swam in the Neckar River and played all over the castle and in the old streets. The adults, German and English, played bridge and drank Steinhager and laughed a lot. It was wonderful part of my childhood and I remember all of it. It broke my heart to come home again. I loved Europe and to some extent it is still the home of my heart. My brother and I never quite fit in again. We spoke two languages; we had been to the great museums and seen and done amazing things. We were alien beings in our own country. We spent that first year home in Colorado with my mom forcing my dad to retire and return to California. He caved in and did what she wanted as usual, and we came home to a small farm town where we really did not fit in, ever. Perris, California. My brother and I were miserable in a whole new way. He was now a double geek, with high culture and thick glasses. He never had a chance. My mom slid into angry craziness probably fueled by frustration with my dad. She always wanted a race horse, but she married a cart horse and that’s all he ever has been or will be. The best cart horse in the world, but it was never enough for her aspirations. During those years the spankings became beatings accompanied by verbal abuse that broke my brother and put some serious cracks in me. My dad was a shadow on the moon, my mother was always between us and I never had a chance to know him until it was almost too late. I was the lucky one. I escaped the craziness. My trajectory was up and out from the day I got out of high school. Yes, I have lived my own form of craziness but it’s always been fueled by joy and hope and possibility. My brother never got away. My mother bound him to her with guilt and money. My grandmother treasured him and my dad, and spent every penny she had on the two of them to spite my hated mother. They had to borrow money to bury her when she died because she had given it all to “her boys”. My parents bought my brother a car, paid the insurance, bought him everything he ever wanted and extracted a high price in guilt and pain and anger. Their relationship was and is toxic, like two pit bulls fighting in a bag. They are compelled to bite and tear at each other. Neither has ever figured out how to accept responsibility for their actions, it’s always someone else’s fault. My little blonde haired blue-eyed gawky brother turned to drugs in his twenties. He put a successful landscaping business up his nose, destroyed two marriages and lost his children to ex-wives who were fed up. He still talked big and told stupid annoying jokes and slid downhill into petty theft, meth and crack. My mother is the most profoundly selfish person I have ever known. She is the center of her universe and if she gives you anything there is a high price to pay in both money and expectation. Mother kept him living in his house that she purchased according to her, in complete denial of what was happening to him. She took everything he got in return. I think somewhere along the line he gave up on ever getting out and focused on hating her, stuck in the web and too damaged to get out. He is back living in her house, in a single room in the garage with his alcoholic girlfriend and their dogs and cats. He stopped doing drugs a few years back, but he couldn’t get a driver’s license or a job. Too many years of unpaid child support and failure have cost him everything. I choose not to see him or speak to him, too many bad choices lie between us, but I am grateful to have his daughter in my life. 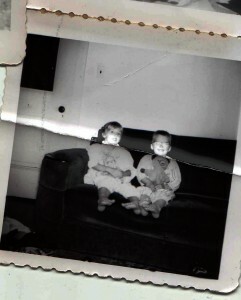 It’s like a do-over because in Hed I can still see that bright boy, the one who was almost my twin, the funny curious kid I explored the world with. Hed is an incredibly talented writer who is battling her own set of demons. She suffers from bipolar disorder and every day is a fight for her. She has a husband in Australia who doesn’t want to live in America. Like me, she has food issues and I wonder if that’s genetic too? I just love good food and good food loves me. It loves my whole body to the tune of about 80 pounds I need to lose. So Hed, here’s the thought I had today. Beginnings are like jumping rope, the kind where your friends are holding the rope and turning it. You are standing there counting and deciding where to jump in. It’s always going to be in the middle as long as the rope is turning. There is no clear beginning when you jump rope or begin a diet or anything new because that rope is always turning and the best you can do is run in and believe you can keep jumping, hell, KNOW you can keep jumping. You have to have faith in you and the jump rope. Sometimes you’ll step on the rope and it will stop, but you’ll go around, count and jump in again. People who love you are holding the rope and they won’t let go so keep jumping! I love you. Wow. That was an awesome share, and very sweet of her to write that. Sounds like some heavy genetic odds, but I love the jump rope analogy. Keep jumping, you know you can, you know you have to, even if you don't believe it now. Oh my god, that post was beautiful and heartbreaking. Thank you for sharing, Hed! This was a very uplifting, massive share of, truth, reality and greatness. Thanks Hed. I love old black and white pictures of peoples family. I need to scan and post some of my own pictures like that. Wow, Aunt Roxy is amazing! Beautiful, profound writing. I wish she could be my aunt, too! You are so fortunate to have her in your life. She is wise. Listen to her, as she has much to impart. She is a wise woman head. Accept what ever help she offers you. You need your family right now. oh, hed. i love you. i'm holding your rope. That was an awesome story and she sure is a talented lady. We are all holding the rope girl and want to be there for you. I felt something deep in my heart with this post. You know, you amaze me more and more with every post. You dig really deep and show parts of yourself and you show me your bravery. It takes balls to do this and honey you got it! Proud of you ma! that post was beautiful and heartbreaking. Thank you for sharing, Hed! I'm so glad you came around. Thanks for reading everyone. I'm glad you all liked it and were moved by her story. That was so amazing and honest. You have an awesome aunt. It's good to know that you have SUPPORT! Don't give up, keep trucking because there are people that love and care about you and want you to succeed!